This post is written by Jing Ying Yap, UNM 2018 3MT® Runner Up and PhD student from the Department of Chemical & Environmental Engineering. On 5 September 2018, I participated in UNM 2018 Three Minute Thesis Competition (3MT®). I presented my research topic entitled “Papaya Leaf for Dengue?”. Effective communication is so important especially to researchers because the topics of PhD projects can be very specific and technical. In order to let people from other fields to understand our work, how to effectively deliver our message could be a very challenging task. This can also bridge the academic and industry people, so that our work can be applied in real life. Being the runner up for the 3MT® competition has been one of the most rewarding experiences of my postgraduate student journey this year. I had also participated in few other competitions organised by the Graduate School such as Postgraduate Showcase and LINK’18. These experiences were totally precious and unforgettable. I learned to present my work confidently. To prepare for the 3MT® competition, the skill of making people understand my research by simplifying it was the best thing I have learned. This polished my communication skills where I proudly presented my research work to the general audience. I was truly shocked when my name was called for the runner up in the 3MT® competition as my purpose of participating was to accumulate experience so that I can prepare myself well before joining any conference. To my fellow postgraduates especially the future 3MT® participants, what I can say based on my own experience is that “taking the first step is the beginning of a journey”. So just go for it and do not be afraid of failure by maximising the value of participating in every competition. Success will come to those who are passionate. 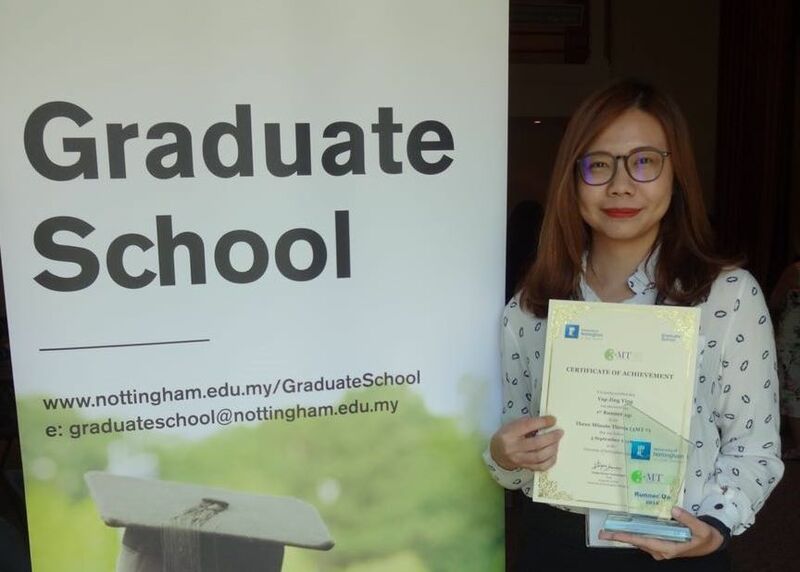 Before the competition, the trainings provided by the Graduate School gave me a lot of support e.g correcting my pronunciation, reminding me to keep eye contact with the audience, engaging with the audience and fully utilising body gestures to help in my speaking. Besides, we had a rehearsal before the competition day. This actually helped me to get familiar with the stage, microphone and also the time management during speaking. I am grateful to be selected as the runner up for this year’s 3MT® competition. Thanks to Graduate School for holding the competition, providing me a platform to maximise the experience as a postgraduate student. Nevertheless, I would want to take this opportunity to show my gratitude to my supervisors and my family members. I will never be who I am today without their unconditional love and support. Jing Ying (right) accepting the award from Professor Deborah Hall, Vice-Provost of Research & Knowledge Exchange. Jing Ying Yap was crowned the Runner Up for her presentation entitled “Papaya Leaf for Dengue?” at UNM 3MT® 2018 Competition held on 5 September 2018. 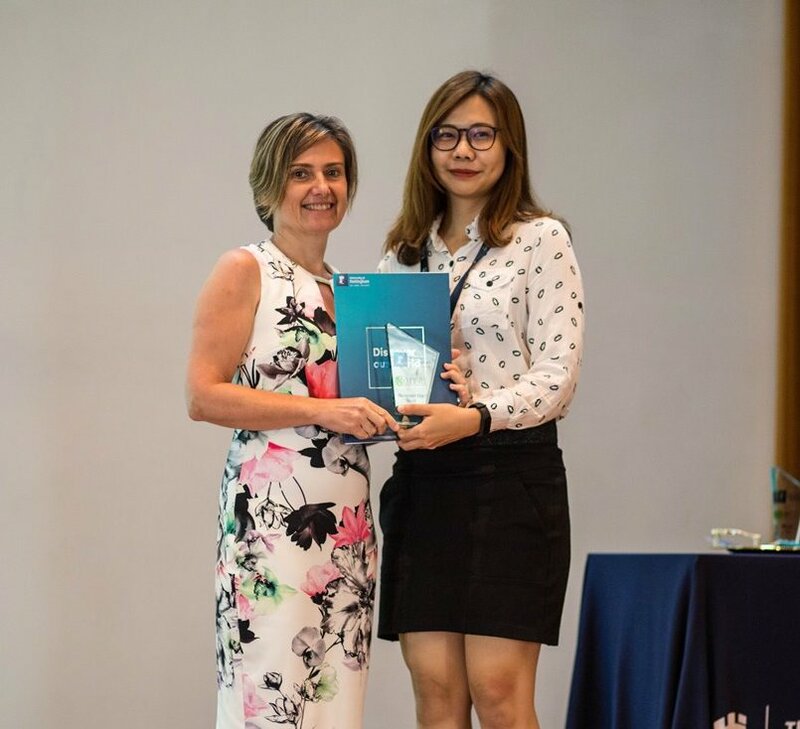 In her winning presentation, Jing Ying described her research on studying the effects of different drying processes of carpaine, a major active compound in papaya leaves to treat dengue fever, to develop a better preparation protocol for higher carpaine retention.